"World hypotheses" correspond to metaphysical systems, and they may be systematically judged by the canons of evidence and corroboration. In setting forth his root-metaphor theory and examining six such hypotheses—animism, mysticism, formism, mechanism, contextualism, and organicism—Pepper surveys the whole field of metaphysics. Because this book is an analytical study, it stresses issues rather than men. It seeks to exhibit the sources of these issues and to show that some are unnecessary; that the rest gather into clusters and are interconnected in systems corresponding closely to the traditional schools of philosophy. The virtue of the root-metaphor method is that it puts metaphysics on a purely factual basis and pushes philosophical issues back to the interpretation of evidence. This book was written primarily as a contribution to the field, but its plan excellently suits it for use as a text in courses in metaphysics, types of philosophical theory, or present tendencies in philosophy. 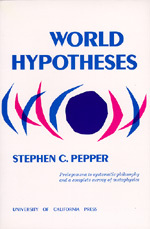 Stephen C. Pepper, well known for this and his many other contributions to the field of philosophy, was at the time of his death Mills Professor Emeritus of Intellectual and Moral Philosophy and Civil Polity at the University of California, Berkeley campus.